The use of multiple monitors or multi-displays to increase the productivity is a catching up trend nowadays. Some users are perhaps looking at setting up multiple monitors but cannot figure out how it can be done. To simplify the set up for users, DoubleSight Displays has brought to users a straightforward multiple monitor solution by unveiling its Smart USB Monitor solution. Available in two sizes, 7-inch LCD display (model DS-70U) and 9-inch LCD display (model DS-90U and model DS-90UC), the monitors and stand weigh about 1.5 lbs making it easy to tuck into a briefcase and carry around while on the go. They are ideal companions for laptop or netbook users who need an expandable workspace. 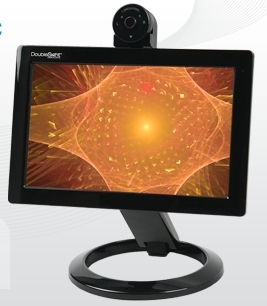 DoubleSight Smart USB Monitors require no video chipset, video port or power adapted, and work in both landscape and portrait viewing modes. The 7-inch LCD monitor supports up to 800×480 screen resolution while the 9-inch type supports 1024 x 600. Model DS-90UC is mounted with an additional compact web cam which can facilitate users with video conferencing and Internet voice services. Model DS-70U is priced at $120 while model DS-90U and model DS-90UC are about $140 and $160 respectively. All models are compatible with both Windows and Mac OS X PCs.